The retina is like the wallpaper that lines the inside of the eye. In some cases, this wallpaper can detach itself from the eyewall, a condition called retinal detachment. 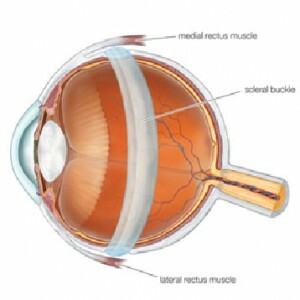 A scleral buckle is a large belt used to indent the eye from the outside. This enables the retina to reattach and stay attached more easily.